I worked as a clinical counselor for children and families affected by trauma for over 20 years. One of the first questions I asked my young clients was, “Do you have any pets?” Most of them did. The question seems simple enough, but it actually was very powerful on many fronts. First of all, it allowed me an opportunity to open up conversation with them in a friendly and non-threatening manner. Children are naturally curious about animals, and even if they do not have a pet of their own, they usually have developed a relationship with an animal at some point in their life, and they have some interest in talking with others about their pets. Asking about pets also allowed me to explore other clinical information without being too intrusive. How were pets treated in their home? Had the child experienced losses of pets? Had someone in the home been cruel to pets? Had the child ever had a frightening incident with an animal? Of course, one of the first questions I asked parents and caregivers was, “Has the child ever hurt animals?” I also asked if anyone else had harmed animals in the home. I asked several other questions in clinical assessment interviews, but I always found questions about pets to be particularly illuminating. Understanding how children relate to animals is very important to understanding their inner and outer worlds. A child who treats animals in a loving manner has strength of compassion, and likely has supportive, loving people in his or her life. A child who harms animals often has deep psychological stress and limited familial support. Children who harm animals often have been victims of violence themselves and they are re-enacting their trauma through their behavior towards vulnerable creatures. They often lack supportive adults in their lives, and they often have overly stressed adults for caregivers. If their angst is not redirected, they are likely to move on to harming human victims in their attempts to overcome their inner sense of powerlessness. Few children who harm animals grow up to be serial killers, but many do grow up to abuse their intimate partners and their children. Serial killers are rare aberrations of humanity. Domestic violence, however, is an all too common problem in all human societies. Stopping abuse towards animals is a worthy activity in and of itself. But if we teach children early to be compassionate towards animals, we can also help to reduce domestic violence and child abuse in the human community. We can help children learn that abuse to animals is not normal, and we can help troubled youth find the supports that they need. Humane Education – Teaching children in schools and special programs about compassion and respect towards animals. Humane education often teaches children about responsible pet ownership as a way to generalize concepts of responsible citizenship and action towards social justice. Pet Respite coordinated with domestic violence outreach and shelter services – Many domestic violence survivors are reluctant to seek safety for themselves when they have no options for providing safety to their pets. When survivors are offered temporary respite care for their pets, they are more likely to leave an unsafe relationship with an abusive partner and go to a shelter or other safe place. Domestic violence shelters are partnering with animal rescue groups in several cities around the country to offer this needed service that helps both animals and people. Psychological Trauma Treatment – Mental health professionals are becoming more specialized in treating survivors of emotional trauma. Professional treatment for individuals who have experienced abuse and neglect can often redirect wayward impulses that can lead to the abuse of both animals and people. Criminal Justice – More and more, severe incidents of malicious treatment towards animals are being addressed seriously by the courts with judges ordering strong penalties for perpetrators. The justice system certainly has a long ways to go, but the tide is turning as society takes a stand against animal abuse. Relatively few people are aware of the movement, however, and few understand its necessity for improving both human and animal life in our communities. Few know about the connections between animal abuse and abuse to human victims. Few understand that animal abuse is a serious problem because of its implication that humans are likely being abused as well. Some say that domestic violence and child abuse are more important concerns to address than the needs of animals. Here is the truth. When animals are suffering in society, children are too. 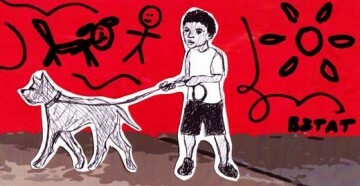 When there is violence to animals, there is likely violence to children and others who may be defenseless. I created the Okey’s Promise Art for a Cause program to stimulate awareness and promote action in communities on the issue. Through public art projects, people become more aware and new dialogues promote action. So far I have created 2 projects in Canton, OH. Both projects were funded by numerous “Okey’s Promise Keepers” from around the world who wanted to be a part of the movement. The resulting dialogue in my community has led to a partnership between a local animal rescue group and the Domestic Violence Project that offers respite to pets of individuals and families seeking temporary shelter services. You can become an “Okey’s Promise Keeper” too by contributing to my third project, which will be a mural on a building in Barberton, OH. My hope is that this project will stimulate interest in the Summit County, OH area to more proactively address the links between animal abuse, domestic violence and child abuse. Vicki Boatright, aka Artist BZTAT, is a full time artist who worked for 20 years as a Licensed Professional Clinical Counselor. She specializes in animal themed artworks, and she is known worldwide for her colorful custom pet portraits and public art murals. 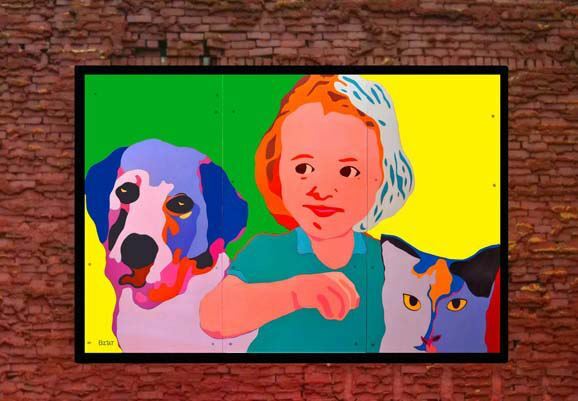 She created the Okey’s Promise Art for a Cause program to create widespread awareness of the links between animal abuse, domestic violence, and child abuse through public art projects. You can see her artwork on her BZTAT Studios website. In fact, many serial killers were kinder to animals. For example, the Birdman of Alcatraz. The reality is that very few serial killers abused animals prior to harming humans. The only studies I’ve seen to support this were produced by animal activist groups (or funded by them) or extrapolations of the original (very poorly done) survey by the ASPCA and another by the HSUS, neither of which is now readily available. Perhaps you can point me to some valid scientific studies to support this concept. So far, I’ve been able to find none. Yes, in fact, they are often punished more severely than if they’d attacked another human or even a child. IMO, this puts humans and especially children at increased risk. If abusers are inclined to redirect to the most vulnerable and where there is lesser risk of punishment, this increased punishment for animal abuse inevitably increases the risk to humans. Again, I’ll ask you for some viable studies to support this. It has clearly become accepted as “fact” or “truth” by many but that seems to have happened more from simply repeating it over and over rather than by the usual standards of scientific and repeated study. While I do not support any form of abuse to any creature, I am very concerned that we are redirecting animal abusers toward human abuse and, if forced to choose, I choose protecting humans first and foremost. When we elevate animals to a position of more protection than we afford to humans, we merely promote the concept of inhumanity to one another. Hi Leslie/PJ. You pose some good questions. There is considerable research that points to the concurrence of animal abuse and domestic violence/child abuse in the human population. Enough research, in fact, that the National School Safety Council, U. S. Department of Education, the American Psychological Association, and the National Crime Prevention Council consider abusive behavior to animals to be a warning sign for at-risk youth. The issues and the research is summarized in this report: http://okeyspromise.com/wp-content/uploads/2011/01/DDAF-Violencefin.pdf. 1. Better identify human victims of child abuse and domestic violence. If we raise awareness, animal rescuers will be more alert and better prepared to report concerns to authorities who intervene on behalf of human victims. 2. Encourage women who stay in violent situations to seek safety for themselves and their children instead of protecting their animals at the risk of their own safety. 3. Redirect youth who take out their frustrations on animals before they start acting out aggressively towards people. 4. Provide intervention for children and families that are overly stressed and in need of help. 5. Collaborate human and animal services to provide better safety for all. I made the point about serial killers, as there has been considerable media coverage of some of the most egregious killers having a history of harming animals. Many people now know that there is a connection between serial killers and animal abuse.The more common connection to domestic violence is less known, though, and really, it is the bigger danger. I can understand your concern that increased awareness might redirect animal abusers toward human abuse. Without going into a lengthy psychological discussion, I will just say that this has not been born out in the research of human aggression. I appreciate your questions and your input about the need to avoid “elevating animals to a position of more protection than we afford to humans”. I cannot agree with you more on that point. As someone who comes from a family where violence against women was common until my own generation and as someone who worked with abused women for years before and after becoming a lawyer, this is a subject near and dear to me. I really hoped you would provide some viable science; part of me wants very much for there to be enough of a connection to get behind this concept. Unfortunately, to support your position, you turned to the Doris Day Animal League which was one of the most radical activist organizations. That became especially clear when they merged with HSUS in 2006. This merely points out that these theories are an attempt to bootstrap animal rights activism onto the back of abused women and children to the detriment of those humans. Something that becomes clear to those of us who have actually looked into those old SOP sources cited in the DDAL publication and the history and funding for those. The “connection” hasn’t been widely accepted because it is falling apart in the same way that the attempted connection between animal abuse and serial killers fell apart. Since you agree on my central point, I hope you will update your research and support animal welfare in a way that does not put humans at additional risk. I am especially concerned about the pet respite programs. There are a small number of these which shelter pets in the same facility with the humans. While I approve of the concept, as we all know, these facilities are desperately underfunded and adding pet care further stresses the system and reduces the number of human victims who can be accommodated. Most of the pet respite programs I’ve looked into were being promoted by the most activist of the animal rights groups and were designed to permanently remove the animals from their human companions by providing far too short of care for the pets and leaving the owner with the only option of surrendering the pet to the organization providing care. These are the same groups who notoriously swoop in after disasters claiming they will provide care until owners can retrieve their animals but actually disburse the animals and profit from them who are running these programs. The last thing someone who has been through domestic violence needs is to loose pets and feel betrayed yet again. This appears to be a relatively current list of links to pet respite care. Please note the majority are connected to HSUS’ program (which provides the mantra but not the funding). You make some interesting points. The research is not conducted by the animal rights organizations, however. It is simply distributed by them. If you look at the reference page from the article I offered as a source, you will see that there are many references to psychology and psychiatry journals as well as papers presented at conferences for domestic violence programming and research. The article is a summary of research that is being disseminated by animal rights organizations, but they are not making any claims for having conducted it. I spoke with the Executive Director of my local shelter about this and we agreed – the Domestic Violence and Human Service Systems are not doing as much public awareness on the issue as the animal welfare organizations are, and that needs to change. Domestic Violence service providers are no less concerned, however, and they see the need for addressing the issue as importantly as do animal welfare organizations. We are working to change the disparity in our community and encourage others to do the same. Combining efforts is not “boot strapping”, rather, it is combining finite resources to better serve mutual interests. When two parallel systems are using limited resources for similar missions, there is duplication of services that is ineffective for both. Combined missions and resources leads to more efficient use of resources and better services to meet both missions. Most programs of which I am aware offer respite for pets of shelter residents through a network of pet foster homes. These foster homes are typically funded through an animal rescue organization. There are some programs that allow shelter residents to bring their pets with them, however, I am not aware that the funding that supports these programs draws away from other service funding. My contact with domestic violence professionals has shown them to embrace programming for pets with open arms. They have seen too many victims take unnecessary risks with their own safety because of the lack of care available for their animals. Their desire is to remove impediments for victims seeking safety, and if offering safety to their pets will do that, it is worth doing. That is simply untrue. Here’s one example and you’ll find something similar for each of the cited references if you actually do the research as I have already done. Ascione makes his living largely by doing research bootstrapped onto ASPCA’s initial and poor study and funded by even more radical groups like AHA. This type of research is no more trustworthy than drug studies done by manufacturers and not subjected to professional vetting. This conversation is SUPER important to me as I map out exactly what I want AWE to be and what it’s primary goals are. I’ve been imagining that one very important aspect of the work will be helping to identify children with violent tendencies – not that volunteers would be specifically searching for that, but that if a child wanted to bully the animals or talked about hurting animals, volunteers would be trained to bring this to the attention of a teacher or administrator in an appropriate way. I don’t have expertise in several (many!) of areas that I’ll need to learn about (and recruit experts in) to make this org successful, so I plan to read everything I can get my hands on. I appreciate everything you’re both sharing, as I’m sure the other people reading this conversation do as well. and they are closely allied with HSUS. In other words, that item I cited above was FULLY funded by animal rights activists from the extreme end of that spectrum. I have yet to see a single bit of alleged research on this topic that was not funded by these extremists. I’ll be thrilled if you can actually produce one or two but I doubt it. My research is generally impeccable. I haven’t read any of the documents yet, but I wouldn’t think the source of funding should mean fully discounting the findings by default. I am looking forward to to reading all of the referenced material. You’re right Jenna. It isn’t as simple as that. When looking at research, one looks at the entire body of research on the topic and especially for a variety of authors where they aren’t building upon their own or each others’ research within a small bubble. Quantitative research is easier to evaluate because it can either be duplicated or not and there’s almost always others in the field who will attempt to do so and reinforce the existing concepts or prove them wrong. Qualitative research is more difficult but the first thing one looks to is who is doing the funding which may indicate an inclination to influence the outcome. One also looks at the author of the studies to see if they seem to have a consistent bias. The problem with this body of research is that it is all done by a handful of people, most of whom have built upon Ascione’s work. In addition, it is all funded by a very small group of extreme activists. For me, this brings the credibility and neutrality of the work into serious question. None of these studies has been subjected to any level of serious professional rigor which is also one of the foundations of research. Simply put, it isn’t whether the research is persuasive on its face but whether it stands up to rigorous analysis. I find this body of research fails that test mostly because none in the professions have even sought to test it and it fails based on logic as well (which is, I suspect, the reason others have not attempt to confirm it with their own research). How to evaluate qualitative research is still of some debate but this is a pretty good starter on the topic from 2003 and I think it’s also notable how little has been published on this topic since more rigorous standards have become the norm.